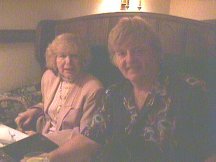 Our meeting with Mary Burroughs, second wife of John Coleman Burroughs, came about as a result of a friendship which we had developed through many telephone and e-mail conversations over the year previous to the Tarzana ’99 Dum-Dum. Although her career as a medical claims auditor keeps her extremely busy - she audits health plans all over America - she agreed to visit with us in Tarzana. Mary met us on Thursday evening upon our arrival at the Marriott, and treated Sue-On, our daughter, China-Li, and myself to an exquisite meal. The following “interview” is actually comprised of excerpts from our dinner chat captured by my camcorder which was propped between the salad bowls and bread baskets. Mary graciously consented to this intrusion of her privacy. BH: How did you meet John Coleman Burroughs. MARY: It’s a cute story. I was living in Canoga Park which is very close to here. And there’s a Junior College called Pierce College. I went to night class... it was a summer night class... a painting and drawing class. John was there but he was a very private kind of person. He didn’t want anyone to know who he was. So, I don’t remember what name he used but no one in the class knew who he was. And he was such a good artist everyone was in awe of his work. It was a class where they had live models. That’s why he had joined the class... he wanted to use live models to draw from. It was a class of maybe about 25 people and there was a wonderful teacher who was a very Italian man named Mr. Cicero and everyone loved him -- he had a great personality. Everyone enjoyed the class and it was kind of a close-knit group. There were three or four people -- John and a couple of other men -- who were fine artists. And then two or three women who were just there like I was because I’ve always enjoyed drawing and painting but I’m not an accomplished artist. So we went through the summer and we’d go out and have coffee after class – it was an evening class because I worked through the day. I was married and so was John. But maybe by about the end of summer we decided we’d like to sign up for the fall class if we could have him [Cicero] for a teacher. BH: And what year would that be. MARY: Summer of 1956. So we all signed up again with Mr. Cicero and he had this wonderful old house close by and he gave a Halloween party when the fall semester started. And that was really the first time that John talked about himself. “You know,” he said, “I haven’t been giving my right name because I took the class because I wanted the models and I didn’t expect that I’d really want to socialize with anyone in the class.” He told us that his father was Edgar Rice Burroughs, and to be very honest with you, I had never read the Tarzan books... I mean I know who he was but.... John also said to me, “I thought if I’d told you,” ... because by then we were close friends... “I thought if I told you who I was you’d only want to know me because who my father was.” ... and that seemed so ridiculous to me because I was so awestruck over him as a person and as an artist that you know I had to admit it... I said I haven’t even read a Tarzan book. Of course then he gave me books to read and we became very good friends and we were friends for a long time before my marriage split up. We continued to go to art school and then a lot of people that were in this little group said, “Well John, why don’t you give lessons at your house? ...because he had a big studio at his home in Tarzana. And so we quit the class because Mr. Cicero, I think went back to Italy or something, and we went to John’s studio to paint. That was really how we got to know each other. I knew nothing about ... you know I never met his family...he was so private. And he never met any of us... I think there were about four of us who continued with him. We did lots of fun things together and he had a house in Catalina. It was a family house and so he invited all of us to come over for the weekend and we did that. That was how we really got to know each other. But he was really like Tarzan, I think, in the sense that this was a man who rode horseback, went swimming in the middle of the winter in the ocean – was a very physical person and very fit. And he was quite a bit older than I and so to me he was like an Errol Flynn or a real macho action hero. Because he really lived the Tarzan part. We knew each other five years when we got married but it was four years going through divorce and about the last six months of this divorce procedings, because at that time it took a year to get it, now it only takes six months. But anyway, at that time we took a trip to Tijuana to see the bullfights and that was truly the only trip we ever took in the five years before we were married... never went anywhere together. And so, we took this trip and it was like two days. We went down on Saturday and went to the bullfights. John was one of the healthiest people, he said, “Oh I can drink the water, I can eat the food. Nothing bothers me, I’m too healthy.” But while we were down there he contracted a terrible fever when he came back, he didn’t have the toristas or anything, but about two or three days after we came back from Mexico he was just bedridden for a week with this raging fever, And because of his being such a health nut, he never called the doctor, he just lay in bed. He was living on the Burroughs ranch with his brother at that time – they were both going through a divorce. And he just took to his bed and he wouldn’t let Hulbert bring him anything and he wouldn’t let me come to see him. He said, “I don’t know what’s wrong with me but you might catch it and we didn’t associate it with Mexico at the time... just thought it was a bad flu. Finally, after five days of being really near death, I said “You have to go to the hospital, you can’t do this. If you won’t let me see you you’ve got to let a doctor see you.” So Hulbert took him to the hospital and just at the point where he got to the hospital after two or three tests, his fever broke and he was fine. Anyway, it turned out that he recovered for all intents and purposes, but he started having heart problems which he’d never had before, having weakness in his legs and headaches and, this was like maybe April, and his divorce was final and he wouldn’t go to the doctor. He said, “O I’m just having a reaction to all this divorce and all.” And someone said, well, you ought to go to the dentist. Maybe it’s your teeth that’s making you so debilitated. So he did go to the dentist and he didn’t have any problems there, but he was losing the use of his legs, like having weakness in his legs, he was feeling very weak. And so, he divorced in I think about the first part of December and we got married the 16 of December and we went to Arizona on our honeymoon. He was having a one-man show at this gallery in Scottsdale where his agent was and he was too sick to do anything. He drove there but was not well at all during our honeymoon having dizziness and all that. But he still didn’t associate it with anything physical, he just kept saying, Oh, I’ll be all right now – everything’s settled. So when we came back from our honeymoon within six months after the time we were married, he was in a wheelchair – he couldn’t walk at all. And then we took him to the hospital at UCLA for testing and they said that the nearest we can gather when you were in Mexico, you contracted Meningitis. Often people who don’t die from Meningitis, develop Parkinson’s – symptoms at least -- as a reaction. He said, “Oh no, that can’t be possible. I don’t have Parkinson’s.” His father had Parkinson’s Disease and John didn’t even want to acknowledge that. A very famous, now-famous doctor called Oliver Sachs – he’s an Englishman - was doing his residency at UCLA at that time. He’s the one that Robin Williams played in the movie Awakenings, he’s very renowned now, he’s a neurologist. John liked him very much, and he said, “John, you have early Parkinson’s Disease.” ... and John said, “I’m leaving this hospital. I don’t have Parkinson’s Disease!” ... and he went home. This Tarzan syndrome of health and strength and to be debilitated like that was almost too much for him to bear. And he was very ill, I’d say for the first year we were married. And then we moved to the beach and I think either Hulbert or someone close to John, maybe a doctor friend, heard they were doing experiments with a drug called Adopamine [sp?] at that time in Europe. They were able to get John on that programme with an experimentation drug. We had moved into a house in Malibu and John had never been in the kitchen of that house because he couldn’t get in there – it was a small beach house – he couldn’t get in there with his wheelchair. After he had been taking Adopamine for maybe about three months, one day he got up out of bed and walked into the kitchen. For him that was one of the most thrilling moments of his life, to have the use of his legs again. And so, from that moment until he died, he became devotedly addicted to Adopomine, in other words, it was like this game he played every day because you could only take the Adopamine from eight in the morning until eight at night and then you had to stop and wait till the morning again. It was like every single day and night, he would say, “Will I be able to walk tomorrow when I take the medicine?” ... and it became a real obsession with him. And he couldn’t paint because he couldn’t really use his hands that well. They weren’t as bad as his legs but part of it was his severe depression. He just didn’t want to do anything. He’d take the medicine and check to see if he could walk. He never took up painting again. He became so obsessed with his illness and didn’t want to see anyone except his kids. He really had such a terrible reaction to the thought of never being able to be how he was. He was so sad. When I met him he was in his early ‘40s so must have been about 48, at this point. To know that you can never have the kind of control over your body that you’ve had all your life was just too much for him. MARY: The ranch which was across from where John lived, was I believe divided. There was a country club, two country clubs, on the property, so it was a big piece of property, but I don’t know if that house they lived in is destroyed or if they kept it. BH: According to ERB biographies, it was torn down many years ago. MARY: What was the biography. I would like to read that. BH: Well, the best one is out of print... by Porges. MARY: I have that one and you can’t believe what they went through trying to find the proper person to do the biography. I mean, that was when John was well and early on. They went through so many candidates who wanted to write the biography and they just wouldn’t allow anyone. Porges must have been a very fine man in order for him to be allowed to write the biography... and they didn’t want anyone to say one word, one disparaging word or humanistic fraility in the world. So every one who would say, can we tell the story of such and such, they were gone... they were banished. He was smart enough to know that he wanted to do it, and how to do it. It was well-researched and took a long time. There was nice book published of John’s paintings with some autobiography... I don’t know if it was a limited edition.. I have a copy of it.... it’s a big book and there’s a painting on the cover... it’s kind of a grey-white fabric cover and there’s a painting of John’s from one of his dad’s books... I think maybe it’s Pellucidar. I think they only had a limited edition published and they gave one to each of us. You should try to get one because that would be a collector’s item. We have a few of the early Tarzans that John gave to the kids that I’m sure are collector’s items. Some of them are Big Little Books. John did a lot of cartoon work... I think he worked for Warner Brothers at one time. He was so gifted. He could do anything, he could draw, he could paint and he could do etchings. His work became so closely guarded. When he got sick and he realized he couldn’t paint anymore, he became very possessive of his work. He didn’t want to sell any more. He wrote to some of the collectors that had his work and wanted to know if they wanted to sell it back. I think he had a feeling he was losing his ability, even though I think a lot of it was emotional. But that may be why Danton and his brother have put his work away rather than show it, too bad because they wouldn’t have to sell it. I’m sure that Danton probably has a lovely home, because I know that even as a kid he collected old juke boxes and some interesting things that are probably worth a lot of money – and now he has the means to probably really get some treasures. It’s too bad you didn’t get here early enough to tour his home because it would probably be very interesting. SOH: Is son John and most of the other ERB grandchildren alive? I’m sure he’s alive but I don’t know anythng about where he ended up. Mike Pierce was a wonderful guy. Handsome. And they had a daughter as well -- she was little Joanne. I mean she was much bigger than her mother, she took after her dad. I don’t know if she is alive. They weren’t much older than John’s kids. Mike might have been 60 now... I don’t know how he died. But I never hear anything about any of the family. Hulbert’s son would have been about my kids age so he was younger. They adopted him right as a baby. I don’t remember where Diane or John are. SOH: We met Hully and the Pierces when we visited Tarzana in the summer of ’71. I remember Jim as being such a tall man. MARY: Oh he was. He was a lovely man. A great personality. SOH: I still remember their faces when Bill told them we had their Tarzan radio series from the thirties on tape... They hadn’t heard the shows since they made them. MARY: How did you get them. BH: I bought and traded for them. They were some of the first radio shows I collected back in the ‘60s. Since then my audio and video tape collection has since grown into the many thousands. After we returned to Canada, I sent the Tarzan shows down to them and in exchange they generously sent me a box of the ERB, Inc. editions and dust jackets from the warehouse. At this point in the conversation, the talk turned to other ERB topics: collecting, the Bibliophiles, George McWhorter, website activity, the various websites I had done to feature JCB’s art and Mary’s paintings, ERB fandom, the Dum-Dum, ERB trading, and Mary’s desire to meet some of John’s fans. 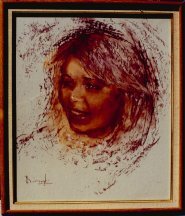 She spoke of her reluctance to sell JCB’s paintings but would consider having prints made so we discussed various ways in which this could be done as well as alternate plans for making JCB’s work better known to fans and the public. 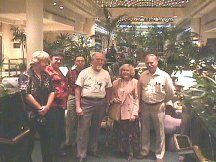 Following dinner we returned to the lobby of the Marriott Hotel where we introduced Mary to Bob Hyde, Jim Thompson, Henry Franke, Bob Cooke, Peter Ogden, Bill Morse, et al. Mary then had to return to Pasadena to prepare for a flight to England the next day. She expressed regret that she would not be able to attend the Dum-Dum activities but indicated that her daughter Stacy would be attending. Stacy accompanied us to the Disney Tarzan showing at the Disney lot, as well as to the Saturday night wind-up banquet. We had a delightful visit and appreciated the JCB stories and photos which she so generously shared with us. The eleven years that Mary and Stacy shared with John were bittersweet – he was in poor health for much of the time but his charisma and aura obviously left them with unforgettable memories of his love, warmth and courage.